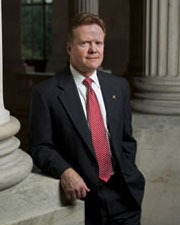 WEBB, James H. (Jim), a Senator from Virginia; born in St. Joseph, Mo., February 9, 1946; graduated high school in Bellevue, Neb. ; attended University of Southern California 1963-1964; graduated United States Naval Academy 1968; J.D., Georgetown University Law School 1975; served in the United States Marines 1968-1972; author, screenwriter, and journalist; lawyer; Secretary of the Navy 1987-1988; elected as a Democrat to the United States Senate in 2006, and served from January 3, 2007, to January 3, 2013; was not a candidate for reelection to the Senate in 2012. Webb, James. Born Fighting: How the Scots-Irish Shaped America. New York: Broadway Books, 2004; Webb, James. A Time to Fight: Reclaiming a Fair and Just America. New York: Broadway Books, 2008.